Noise is a little piece by Tim Brook and Paul Kirwan. It uses pixel averages and a Markov chain. Video noise is the constant background buzz that accompanies all digitally-captured images. 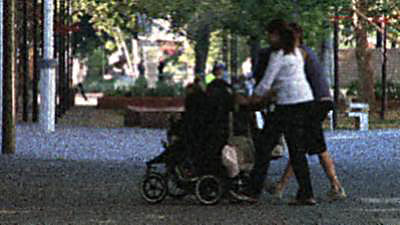 The filmic version of this is film grain, a physical characteristic of the film substrate, that gives a regular noise to all filmed footage. Both video noise and film grain are by-products of the capture of light. They give the moving image character and a sense that the image is always changing, even with a still image. We are accustomed to viewing images with noise, as this noise has accompanied all captured images for the past century. By contrast, generated or manipulated images that are noise-free tend to look too clean and hence artificial in comparison. It’s a simple process to average frames over time in order to reduce or remove grain, but this process also destroys the individual moment captured in each frame, smearing this instant across time. Pictures are sometimes spoilt by film grain or random digital effects. It’s a well-known technical problem. The effect is called image noise. All sorts of experts have studied it, analysed it and written about it. There’s a very simple solution, but the solution has its own little problem. The solution is image averaging. Random variations from the actual image data can be smoothed out by averaging values from several images taken from the same position. Astronomers use this technique all the time. It’s available in many image-processing programs. You can even do it in Photoshop. The only problem with the process is that it also removes people. Are we supposed to conclude that people are simply noise in the landscape? I was struck by the comparison between noise and people; we tend to hurry from place to place, living in each instant, but not leaving a physical presence over the long term. We move rapidly from moment to moment, unaware that our existence leaves little trace on timescales of minutes, days or centuries. Captured in the moment, our presence is real; when averaged over time, the ethereal nature of life makes itself apparent. We are defined by this transience. Noise is an attempt to visualise this reality. The piece uses mathematic structures to move between different states of frame averaging; some of the selections are untouched, while others have been averaged across 20 seconds. The greater this averaging, the more noise-free the result; but as the noise is removed, so are the people. The transience of life is revealed, leaving the viewer alone with the empty landscape. This piece may be taken as metaphor for the quantum effect known as the Heisenberg uncertainty principle. The more we strive to know about one thing, the less we know about another; the more accurately we observe something, the more we alter it; the more accurately we measure the position of a particle, the less accuracy we have in our knowledge of its momentum. There’s nothing new about removing the people from photographic images. Long exposures times have precisely this effect, and all of the very earliest photographs relied on very long exposures. Instant photography was hailed as a great technological achievement when it finally allowed photographers to capture people in motion. To be unpredictable is to be ephemeral. For this piece, the random artifacts in a video loop were removed by image averaging over progressively larger numbers of frames—1, 4, 16, 32, 64, 128, 256 and 512. This process produced eight versions of the loop. They range from a version with lots of noise (and some people) to the one with almost no noise in which the people have been reduced to a vague mist. These eight versions are recombined in the installation using a process of controlled randomness known as a finite Markov chain. The Markov process determines which version is playing at any one moment. A Markov process with the same transition probabilities is also controlling the variations in the meaningless rectangles at the top of this page. It took a lot of trial and error parameter tweaking before the Markov chain for Noise gave the right balance between control and unpredictability. I used two techniques for this part of the process, both involved writing programs using Processing. The first step was to calculate a number of statistics using formulae developed by Kemeny and Snell.1 The second was to construct a prototype using coloured rectangles like the ones at the top of this page. Both of these steps were easy to code because most of the work was done by Java classes used in the Processing programs for real-time control of the final audio and video loops. The hard problem, which I haven’t solved, is how to get the video program to work with Paul’s big 1080p video files. I may just have to wait for the increased computing power of the next generation of desktop computers. For Noise I recorded samples of the sounds of City Walk, where Paul shot the video footage. They include sounds of children, adults, magpies, air-conditioning ducts and a merry-go-round. The soundtrack uses traditional sound mixing techniques to combine these samples. It doesn’t involve an audio equivalent of the video pixel-averaging technique, but it does use the same Markov process to determine which mix is playing at any one moment.